September Class III Milk and component prices were announced October 1. It was another great month with Class III Milk prices exceeding $16/cwt. 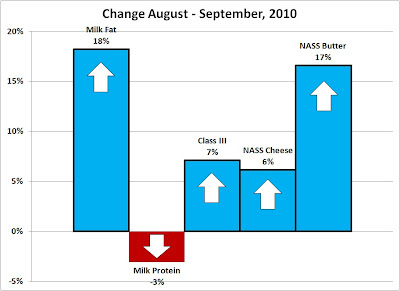 Everything was up with the exception of milk protein and the only reason protein was down was because butter prices were so strong. This relationship will be discussed later in this post. 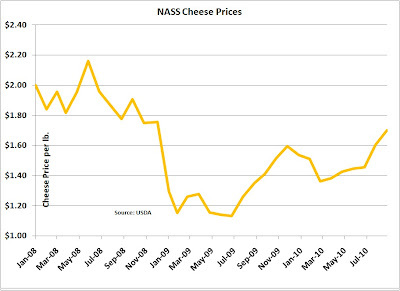 The most important parameter for Class III milk prices is the NASS price for cheese. 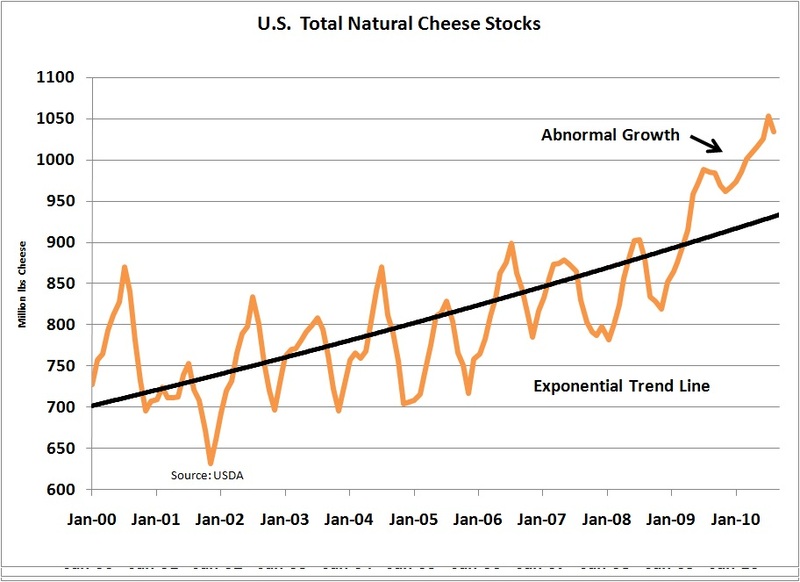 Cheese has been on the rise since the first quarter of 2010 and has risen significantly in the last two months. 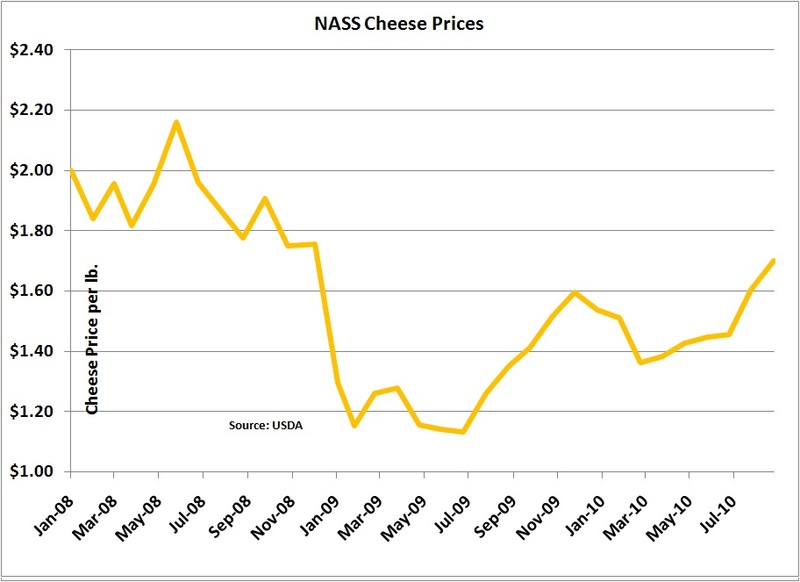 As cheese increases in price, Class III milk prices increase. 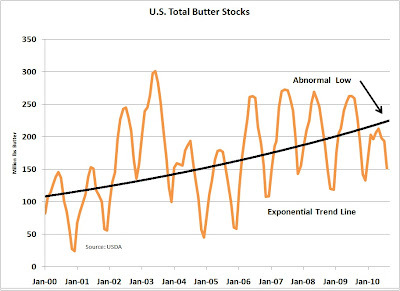 The real mover in September is butter and butterfat. Inventories remain very tight and there seems to be no end to the increases in price. 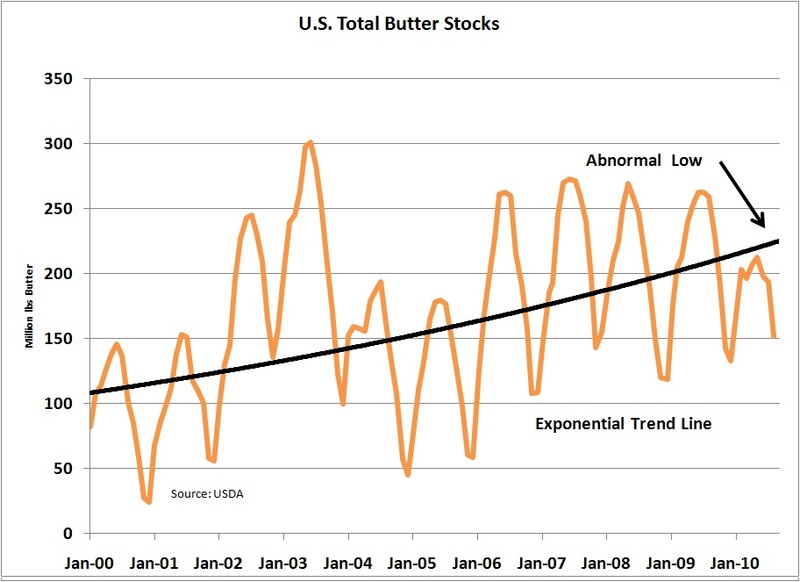 Butter prices are now at the highest level since the current component system began in 2000 with the exception of a short period in 2004. This reflects the very tight inventory situation which does not show any signs of improvement. To emphasize this situation, both the running inventory levels and the annual inventory charts are shown below. Both are based on the NASS survey data. 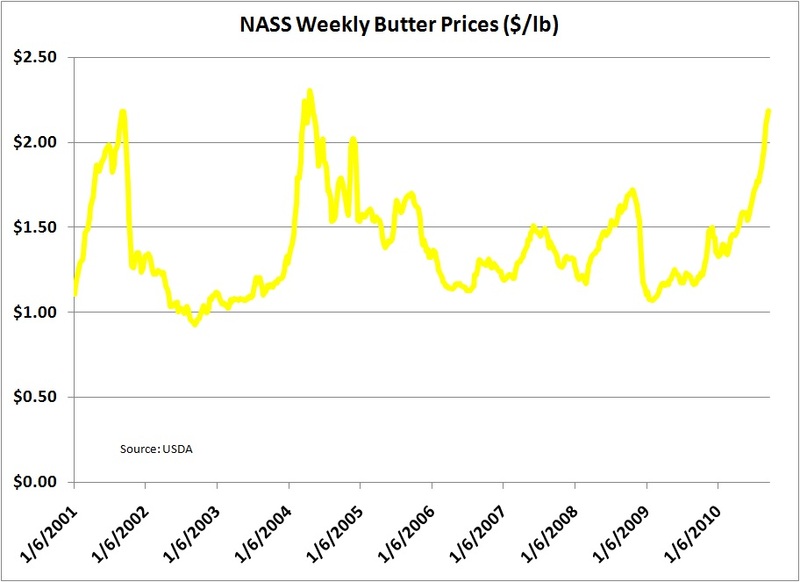 It seems almost certain that butter and butter fat prices will continue to rise. While the butter prices have little impact on the Class III milk price, it does influence the component prices, increasing milk fat prices and decreasing protein prices. 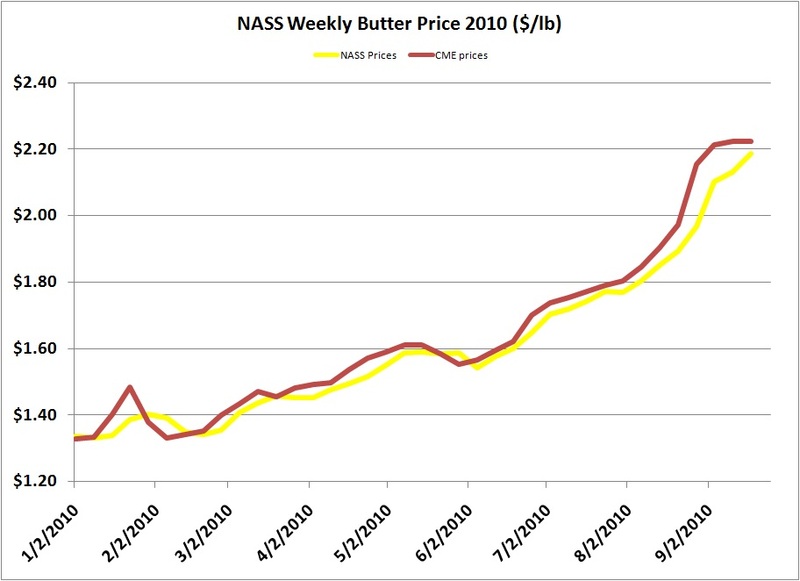 The continued increase in NASS butter prices is not following the traditional pattern between CME and NASS prices. Typically the NASS prices follow the CME prices with about a two week delay. In the current unusual situation, while CME prices have leveled off in the past three weeks, the NASS prices are continuing to rise. As mentioned above and in many previous posts to this blog, cheese prices really dictate the Class III milk price. While it's nice to see the recent increases, inventories of cheese remain very high, in contrast to butter inventories. This really brings into question the duration of the higher cheese prices. 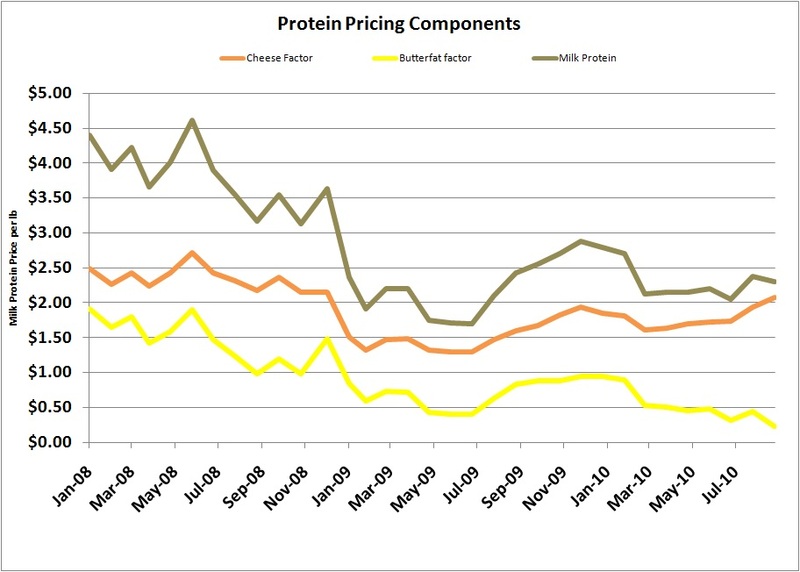 The inter-relationship between cheese and butter prices and the price of protein was examined in a previous post. 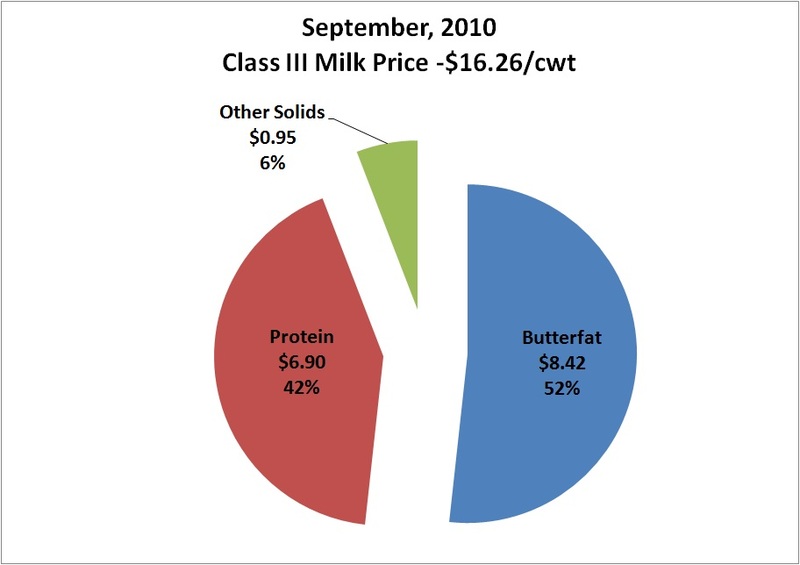 Butterfat is worth more when it's in cheese than when it's in butter. 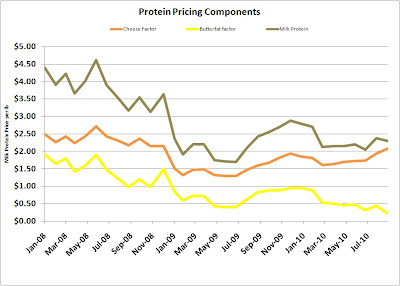 This is one factor in the equations for pricing protein. 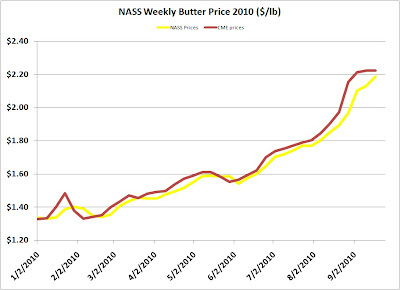 In the current situation, butter is carrying such a high value that there is very little contribution to the price of protein. The chart below has been shown in previous posts, but is updated here to emphasize this important relationship. The current butterfat values contribute to a very unusual pie chart of the Class III milk value. There is more value from butterfat than from milk protein based on the September component values. Where does this leave the milk market? The market always follows cycles. 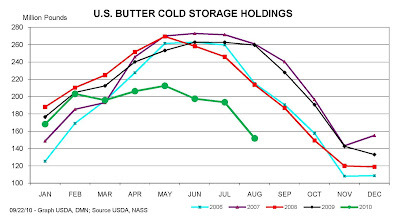 Butter inventory shortages will be resolved, but if history repeats itself and the correction follows the 2004 pattern, this adjustment could take a year. 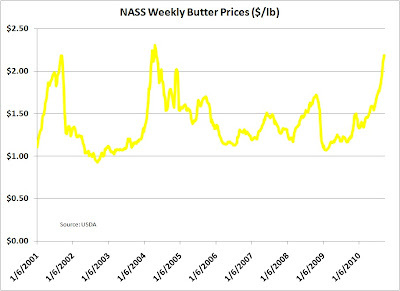 During this time, butterfat prices will remain high. 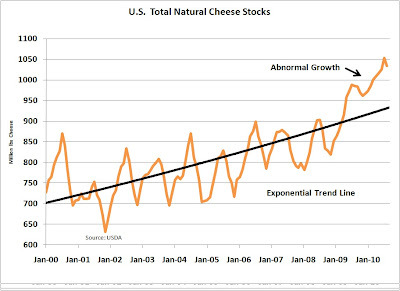 The high cheese inventories will also be resolved, however, the increased pace of exports may demand a higher level than historically, so we may not see the correction to lower protein prices while cheese inventories remain high.